Tenth annual exhibition of artwork and performance by UC Davis intercollegiate student-athletes — 20 in all this year. Nineteen of them will show visual art, 36 pieces total (pencil, charcoal, photography, ceramics, acrylic, watercolor, etc. ), and one who will play mandolin during the reception: 5-7 p.m. Friday, Feb. 1. The exhibition will continue through Feb. 15, during the Buehler Alumni Center's regular hours: 8 a.m.-5 p.m. weekdays and 8 a.m.-2:30 p.m. Saturday-Sunday. 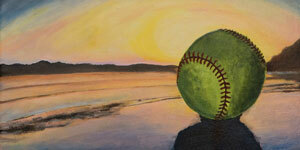 Pictured: Two Favorites, acrylic on canvas, by Meghan Bradbury, a human development major, depicting a sunset and a softball (her sport).